A group of property owners on Hood Head in northern Hood Canal say they have joined forces to lease a nearby beach from the Washington Department of Natural Resources — mainly because they didn’t want to see what a typical commercial geoduck farm might do to the beach near their part-time homes. The DNR never went through with the lease, instead imposing a moratorium on geoduck farms on state land until more research could be done regarding the environmental effects. For information, including a report to the Legislature on geoduck farming, see the Department of Ecology’s page about the Shellfish Aquaculture Regulatory Committee. But the Hood Head owners, having spent money on various kinds of beach surveys, are still pursuing a permit from the Army Corps of Engineers (PDF 5.8 mb) in case the lease goes forward in the future. I outlined their ideas in a story published in today’s Kitsap Sun. Bruce Olsen, whose name is on the application, said he is convinced that using plastic mesh tubes to protect the geoducks will be less environmentally damaging than plastic pipes used on other geoduck farms. I did not include in my story any comments from those who are opposing geoduck farms in other areas — mainly because the folks I talked to were unaware of the tubes that I described. Still, I can tell you that some people are skeptical of any operation in which one species would dominate a beach. Would that be the result if geoducks were grown a foot apart on Hood Head? And would the disruption of the beach during harvest activities be an acceptable price to pay for economic returns on the giant clams, which fetch a considerable amount of money on the international market? Geoduck harvesting remains controversial. Some people are convinced that it creates long-lasting damage to the seabed and to the creatures that dwell on the bottom. Others are equally convinced that damage is minimal and does not last very long. I have never determined for myself if one side or the other is absolutely right, or if it depends largely on bottom conditions at a specific site. As a reporter, I continue to listen to both sides and try to give them each fair treatment. One thing is for sure, however: The money that goes into state coffers from the sale of geoducks is quite remarkable. In a story published in today’s Kitsap Sun, I quote state officials who say the market has remained strong, despite the downturn in the economy. In a single area north of Blake Island in Kitsap County, the state will receive $1.4 million for geoducks harvested this year alone. Similar amounts can be expected from that area for the next few years. The reports, which are based largely on research by the Washington Department of Fish and Wildlife, give the geoduck fishery a “low-effect” rating when it comes to threatened and endangered species. “A low effect HCP is one that NOAA’s Fisheries Service and the U.S. Fish and Wildlife Service determine to have minor or negligible effects on federally listed, proposed, or candidate species and their habitats covered under the HCP,” according to the NMFS Web site. It appears that local trailbikers have taken it upon themselves to upgrade makeshift trails on state land in the Newberry Hill area of Kitsap County. 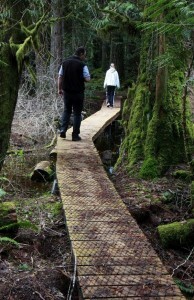 Without permits, a boardwalk was built on state land destined to become a county park. The work — including installation of wooden boardwalks, concrete pavers and plastic culverts — was all done without permits or review by state or county authorities charged with protecting the environment. So are these unofficial trail-builders good guys or bad guys? That is, are they well-meaning folks who just happened to bypass the approval process? Or are they a calculating group trying to ensure that their wishes for the land become stamped into the landscape before anybody can question whether trails are appropriate for certain areas? Kitsap Sun reporter Brynn Grimley raises this question in a story in today’s Kitsap Sun. The state property in question is destined to become part of Kitsap County’s park system, thanks to a proposed land exchange. Those working on the Newberry Hill trials apparently are part of a group that deserve thanks for volunteer work on trails at another county park — Banner Forest. But there appears to be an important difference: Banner Forest went through an extensive planning process to decide what uses were desirable and appropriate given environmental constraints. I have not been to the property nor discussed it’s environmental values, and I promise to keep an open mind. It does seem fair, however, that when the county goes about planning this park, no priority should be given to keeping open trails that were built illegally — or, to put it more kindly, trails not officially sanctioned. After all, trails can be removed if that’s what people want. The county also probably won’t remove the trails once it acquires the land from the state, said Chip Faver, Kitsap’s parks and recreation director. But Central Kitsap Commissioner Josh Brown said the public will determine the uses of the park, not one interest group over another. Washington Department of Natural Resources has fired back at Taylor Shellfish Farms, making the debate over a disputed trespass more interesting than ever. Taylor says the state property where the company has been growing shellfish should have been conveyed to private property owners in 1905. Everyone has assumed through the years that the property was in private ownership. Consequently, the company should own the property today, according to the company’s position, which is based on many technical legal arguments. Not so, says the DNR, which shows in its filing how previous surveys and sales of tidelands indicate that past property owners understood the boundary lines. Taylor’s claims are without merit, according to the agency. I outlined DNR’s arguments in a story in today’s Kitsap Sun. One may also read the document filed in Thurston County Superior Court (PDF 1.6 mb). Meanwhile, Taylor has filed a damage claim of $4.5 million related to this case. It could be an interesting court battle, but I suspect that neither side wants to end up in a courtroom, where spelling out all these arguments could be long and intense. On the other hand, each side may be convinced that it is 100 percent right, which could make a settlement more difficult. If there is a desire on both sides to settle this case, I suggest that they begin by agreeing to a harvest management plan for the shellfish in the disputed beach. Taylor claims that its damages are continuing, in part because some of the geoducks should be harvested right away. Agreeing on how to manage the shellfish, pending a resolution of the case, could set the stage for further discussions. 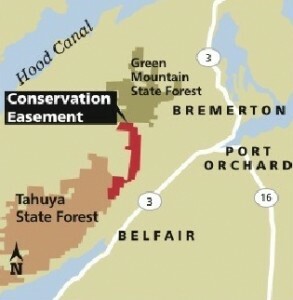 The Washington Department of Natural Resources and Taylor Shellfish Farms have reached an agreement that could settle trespass damages — or maybe not. The damages resulted from Taylor’s cultivation of geoducks on state-owned lands and include back lease payments, taxes, interest and compensation for DNR staff time. See my story to be published in tomorrow’s Kitsap Sun. Taylor officials say they have always believed that the land in question was owned by the company. Apparently, they have convinced DNR officials as well as Commissioner of Public Lands Doug Sutherland, who worked out the details of the settlement agreement (PDF 1.8 mb) as he prepares to leave office. Some environmental folks and local residents of Totten Inlet don’t believe for a minute that Taylor was an innocent party. The case has grown more and more complicated. I’m still wading through the details, but my latest story takes a stab at explaining Taylor’s arguments in favor of a verdict of innocence. For more details, download Taylor’s presentation (PDF 2.5 mb) to the state. Commissioner-elect Goldmark has said all along that there needs to be public involvement in this process. By the looks of this agreement, the people of the state are silenced in an attempt to sign a lease during the comment period. I’ll be interested to see — and report on — the next chapter in this strange controversy.